Our new LCR-3A and LCR-4 Auxiliary Load Control Relays have arrived! These little relays do the big job that many small KYZ switches can’t handle. Housed in a 1” epoxy cube with 18” leads for input and output terminals, the LCR-3A can accomplish the task of switching loads that are heavier than many meter devices are able to switch. The LCR-4 is slightly larger, 2” x 1.5” x .75, and allows either AC or DC loads to be controlled. Although small in stature, don’t be fooled… these relays pack a punch by switching up to 1 Amp across a wide AC voltage range of 12 to 120VAC for the LCR-3A and 12 to 120VAC or VDC for the LCR-4. The LCR-4 also features optical isolation between the input and output. 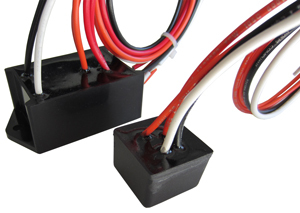 The LCRs were designed to interface between a low current output and a high current load. This comes in handy in situations where the utility meter with KYZ outputs needs to control heavy loads such as storage heat, appliances, or other various electrical equipment, but the current to switch this load is too great for the meter’s little KYZ switch to handle. That’s where one of the LCRs come in to save the day! Due to their small size, the LCR-3B and LCR-4 can easily be positioned inside a meter enclosure or other convenient location. If flexibility and convenience of small size isn’t enticing enough, how about built-in transient protection for the relay’s contacts? This eliminates the need for external or off-the-board transient suppressors. These relays get more appealing by the second! Click here to read more about the LCR-3A or the LCR-4 and their features. Next time you’re in need for a small relay that can handle a lot of power or any other specialty pulse product, contact the experts at Solid State Instruments... we have what you’re looking for! Update 1/16/14: The LRC-3A has been updated to the LCR-3B.